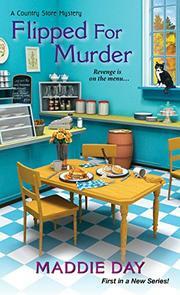 A new restaurant owner is beset by murder and other troubles. Robbie Jordan has moved from California to South Lick, Indiana, the town where her mother grew up, to open Pans ’N’ Pancakes, a restaurant and store featuring antique cookware. Robbie’s aunt Adele lives nearby, and she’s also made quite a few friends, including her handsome lawyer, in the time it’s taken to renovate the old store and upstairs apartment. But not everyone is happy with Robbie’s new endeavor. Neither the owner of a restaurant in a nearby town nor a strange character who wanted the store for himself is celebrating. When the mayor’s snoopy assistant, Stella Rogers, is found murdered, Robbie becomes a person of interest and decides she needs to do some snooping of her own to clear her name. Apparently Stella had been blackmailing a good number of people for years, so there are plenty of other suspects. Robbie never knew who her father was, but her investigation into the murder is sidetracked when she turns up a likely candidate—a handsome Italian exchange student who romanced her mother and whom she greatly resembles. Robbie contacts her possible father in Italy while she continues to dig for dirt at home and finds enough to motivate several attempts on her own life. Day’s series debut provides some quirky characters and red herrings along with the obligatory romantic interest and recipes.